It is mostly agreed upon that the economic landscape of the Gulf Cooperation Council (GCC) region is witnessing drastic shifts; these changes are urged and nurtured by the region’s countries’ plans to decrease their economic dependence on oil industries. The Kingdom of Bahrain is no exception, as it has been implementing projects and policies that aim at developing her non-petroleum economic sectors, specially the real estate market. One prominent example of this is Bahrain Bay project. 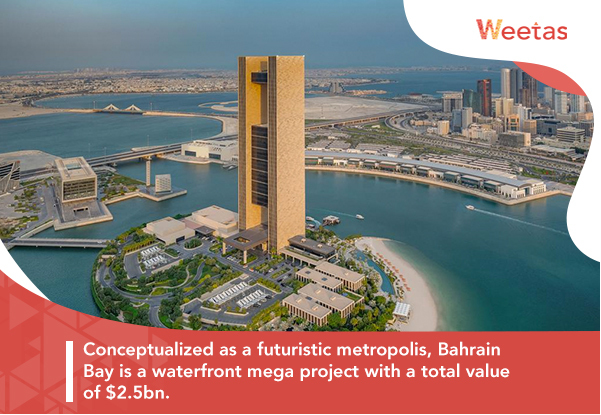 Conceptualized as a futuristic metropolis, Bahrain Bay is a waterfront mega project with a total value of $2.5bn. The project comprises three main islands: the northern island, the southern island, and the central Four Seasons island. The bay came the result of large-scale land reclamation works; it aims at combining a top-notch investment destination for businesses and luxury residential options with modern artistic designs. 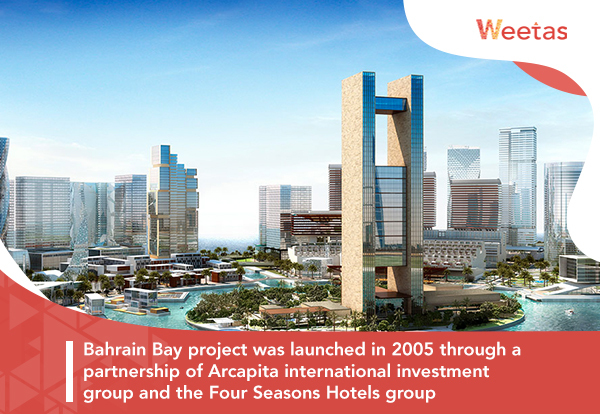 Bahrain Bay project was launched in 2005 through a partnership of Arcapita international investment group and the Four Seasons Hotels group; the headquarters of Arcapita and the Four Seasons hotel two of the main landmarks of the project. 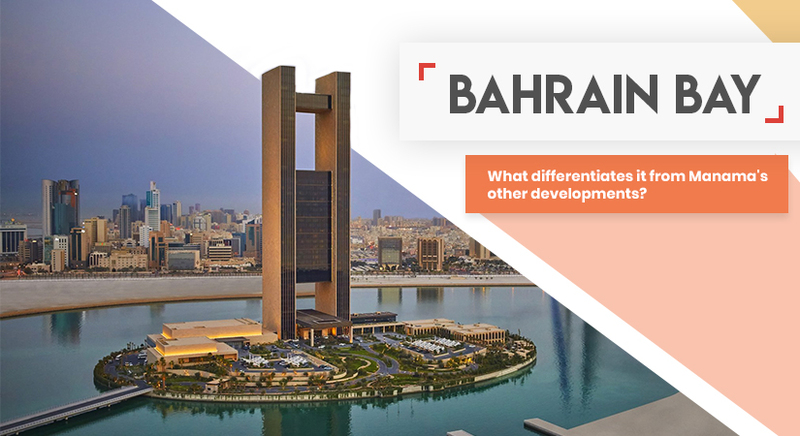 According to Bahrain Bay’s official website, the mixed-use development spans a gross area that exceeds 1.45 million square meters including 450,000 square meters of land. 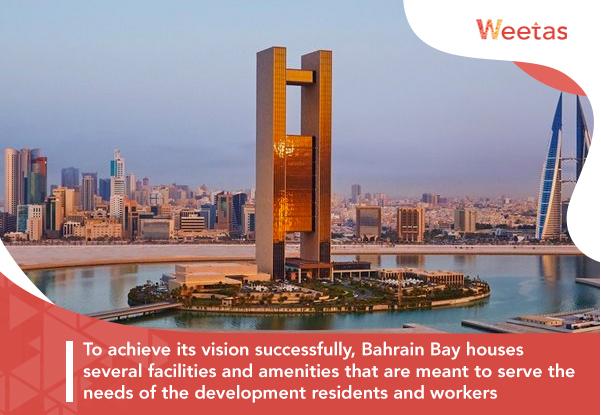 To achieve its vision successfully, Bahrain Bay houses several facilities and amenities that are meant to serve the needs of the development residents and workers, and eventually turn it into an fully integrated community that stands out among a city that is as cosmopolitan as Manama. The reclamation works have been finished with all the necessary services and infrastructure facilities. This included a central cooling plant that is connected to all the parts of the development, two water reservoirs, two sewage pumping stations, and six power plants, five substations with the capacity of 11kv and one primary station with the capacity of 66kv. Bahrain bay also features a harbour that is proximate to Manama’s northern corniche; this harbour is connected to Bahrain’s mainland via two causeways, each of which comprises several lanes. 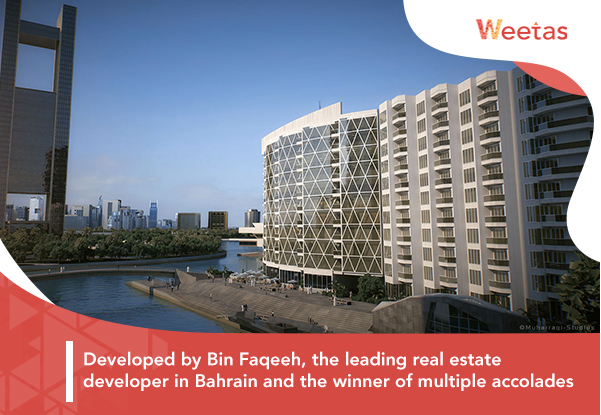 Developed by Bin Faqeeh, the leading real estate developer in Bahrain and the winner of multiple accolades, Waterbay Residence enjoys a spectacular location opposite to the Four Seasons Hotel in Bahrain Bay. The project is due for completion in Q2 of 2019; it comprises three residential towers: Waterbay Middle, the Eastern Tower, and the Western Tower. So what makes Waterbay Residence stand out? Waterbay Residences’ value does not only stem from its unique location in the vicinity of Bahrain Bay’s best attractions; the project is also set to be the first to comprise Hollywood-themed apartments. In addition to that, in January 2019, Bin Faqeeh inked a contract with Roberto Cavalli, the renowned Italian fashion house, for the latter to design the interiors of the Eastern Tower. It is worth mentioning that this marks the first venue for Roberto Cavalli in Bahrain’s real estate market. 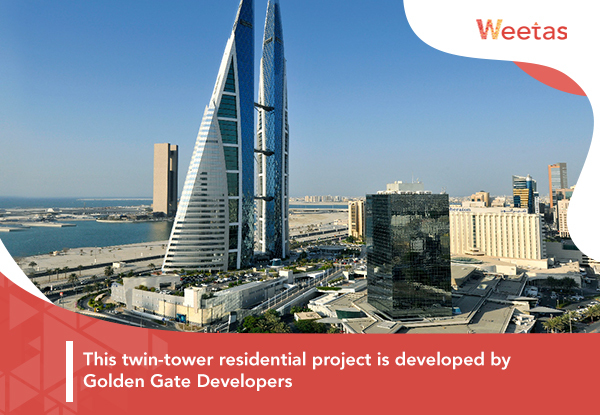 This twin-tower residential project is developed by Golden Gate Developers, a joint venture between the Bahrain-based Kooheji Group and two of the largest India-based developers, Ajmera Realty and Mayfair Housing. Golden Gate towers will span more than 140,000 square meters of land with spectacular views of both the sea and Bahrain Bay landmarks. What is unique about Golden Gate Towers? Not only do the towers indicate a major benchmark in the Indian-Bahraini business relationships, they are also set to be the tallest residential project in Bahrain upon their completion. The first tower will comprise 53 stories while the second will comprise 45 ones; overall, they will include 750 apartments. 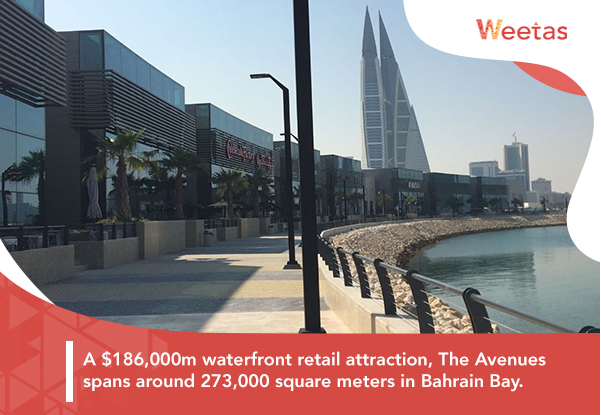 A $186,000m waterfront retail attraction, The Avenues spans around 273,000 square meters in Bahrain Bay. The project is situated along King Faisal Road; it looks over Bahrain Bay with a corniche that stretches over 1.5 kilometers. What is different about The Avenues? With its location, features and facilities, The Avenues is considered the first attraction of its kind in Bahrain. It comprises a gross leasable area of 40,000 square meters divided among 130 stores; half of these stores are allocated for food and beverage outlets and offer stunning views of the water. 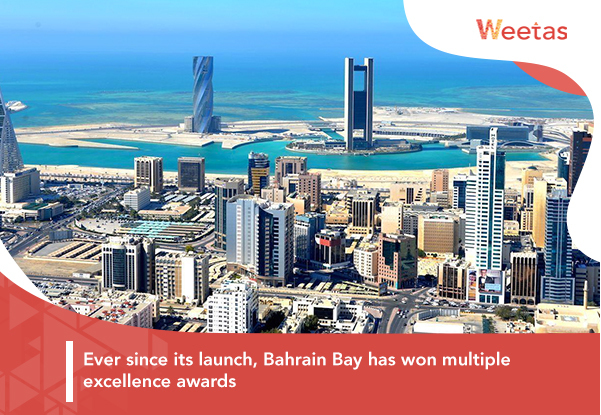 Ever since its launch, Bahrain Bay has won multiple excellence awards; this includes two awards for Best Mixed Use Development Arabia and Best Mixed Use Development Bahrain from Arabian Commercial Property Awards in association with Bloomberg Television in 2010. In addition to that, Bahrain Bay has been awarded the International Arch of Europe in 2007 by Business Initiative Directions. 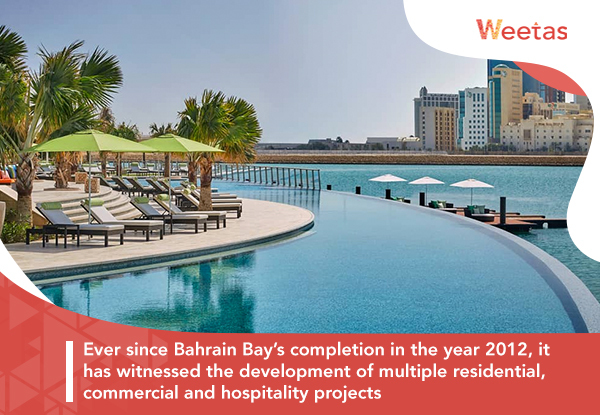 The projects which Bahrain Bay houses, whether they are complete or still under construction, reflect the potential of this project; and as more developments are announced in Bahrain Bay, its investment value is expected to grow as well.